A Japanese spacecraft that overshot Venus last month may get a chance to redeem itself one year earlier than scientists had originally thought. The Japan Aerospace Exploration Agency (JAXA) is now considering trying to send the Akatsuki spacecraft into orbit around Venus five years from now, Japan's Mainichi Daily News newspaper reports. Previously, JAXA officials had said a second try could be attempted sometime between December 2016 and January 2017 after Akatsuki missed its Venus arrival. An earlier attempt to swing back on course would be welcome news for the Akatsuki spacecraft and mission team. The $300 million Akatsuki spacecraft — whose name means "dawn" in Japanese — got within 342 miles (550 kilometers) of Venus the night of Dec. 6, after more than six months of interplanetary travel. It began firing its thrusters in an orbital-insertion burn, a maneuver designed to slow the craft enough to allow the planet's gravity snag it. The thrusters were supposed to fire for 12 minutes, but they conked out after only 2 1/2 minutes, JAXA officials have said. An unexpected pressure drop in the spacecraft's fuel line — or possibly damage to the probe's engine nozzle — are the likely causes, they added. JAXA had said that it would try again in six years, when Akatsuki approaches close enough to Venus once again. But the space agency now says that, despite the loss of engine power, it may be possible to move that second attempt up a year by slowly decelerating Akatsuki to let Venus catch up, the Mainichi Daily News reported today (Jan. 5). Moving the Venus rendezvous up could help squeeze more scientific life out of the probe and its instruments, as Akatsuki would be exposed to less risk of damage from solar radiation, the newspaper added. Shortly after Akatsuki's original failure, JAXA officials had calculated the probe would make 11 orbits around the sun for every 10 Venus makes, putting it on target for a second orbital insertion attempt in December 2016 or January 2017. But the agency is now considering slowly decelerating the craft, which would allow Venus to catch up with Akatsuki after it makes just eight solar orbits, according to the Mainichi Daily News. That may be a better plan, since the troubled probe's engine power appears to have dropped by about 60 percent — meaning it may be tough for Akatsuki to slam on the brakes in six years' time. "At the speed the probe was moving under our first retry plan, it would probably have been impossible to make the orbital insertion," the Mainichi Daily News quoted one unnamed JAXA official as saying. "We hope to explore every possibility, and make an exploration of Venus a reality." 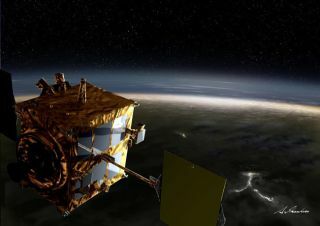 Akatsuki was supposed to spend at least the next two years orbiting Venus, studying its clouds, atmosphere and weather. Akatsuki launched from Tanegashima Space Center in Japan on May 20 along with the solar-sail spacecraft Ikaros. Ikaros became the first craft to cruise through space propelled only by sunlight, and it's still going strong. Akatsuki was the second robotic Japanese probe ever sent to visit another planet. Japan's first planetary mission, the Nozomi orbiter sent to Mars, also failed to enter orbit in late 2003. But Japan did celebrate some major spaceflight successes in 2010. There was Ikaros, for example, and the country's Hayabusa spacecraft overcame daunting failures during its seven-year mission to successfully return samples of the asteroid Itokawa to Earth in 2010.